From fried grasshoppers in Mexico to chicken intestines on a stick in the Philippines, every country around the world seems to have a local culinary item that sounds awful to Americans. 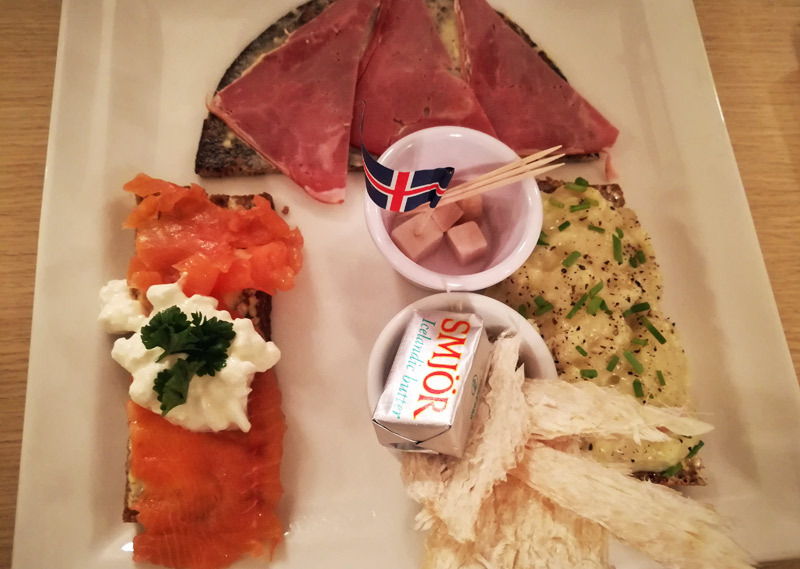 In Iceland, that dish is hakarl, or fermented shark. Shark bodies are hung up for months to ferment, and then cut up into little bits and served without cooking. Yum? Here’s how my shark-eating experience went down. 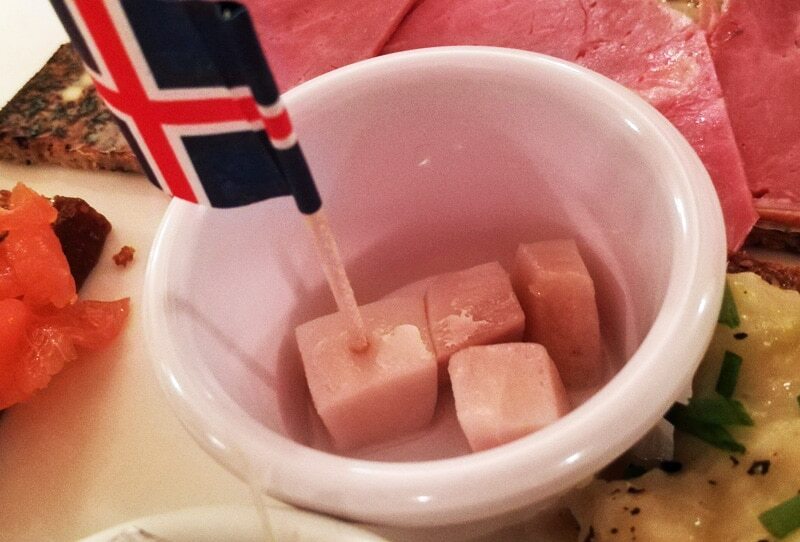 You’ll find a lot of unexpected animals on Icelandic menus, including horse, whale, jelly made from sheep brain(! ), and puffin, those adorable black and white birds that hang around the coast. Hakarl is the weirdest, though, and it had a notorious reputation. 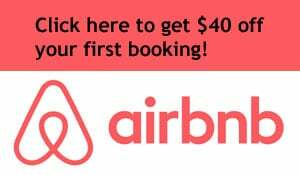 Many travelers have said it’s the most disgusting thing they have ever tried. Anthony Bourdain and Gordon Ramsay have expressed similar sentiments. I knew I would probably hate it, but I had to give it a shot. I stopped in for dinner at Cafe Loki, a cozy restaurant directly across the street from the famous Hallgrimskirkja Church in Reykjavik. Cafe Loki serves “traditional” Icelandic cuisine, and they seemed to be one of the most affordable such establishments in the city. At the top, we have buttered flatbread topped with smoked lamb. On the sides are two slices of rye bread, one topped with smoked trout and the other with “fish mash,” which is literally mashed potatoes mixed with fish bits. At the bottom is a cup of “dried fish” – it’s like jerky. 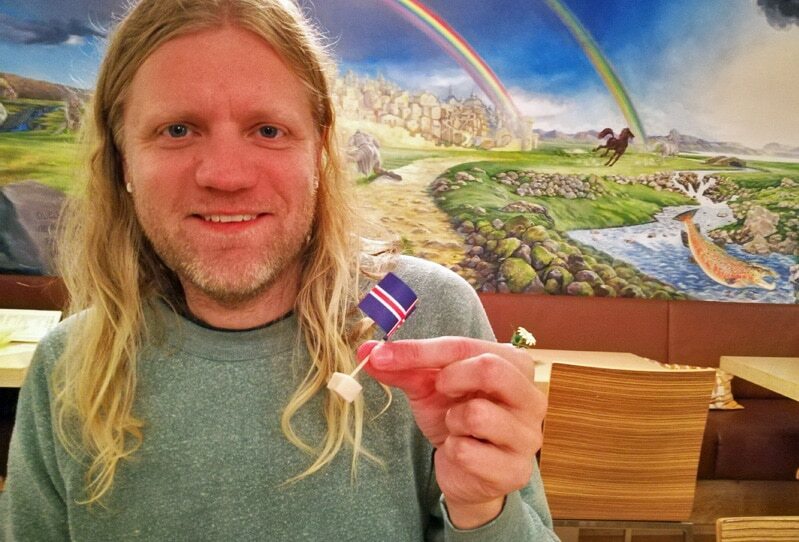 And in the middle, proudly waving the Iceland flag, are the four little shark bits. After gnawing down on a side of root vegetables loaded with more butter than you can possibly imagine, I finally worked up the courage to grab a fermented shark cube. Sometimes, I’d heard, the shark reeks of an ammonia smell, but I did not detect much of an odor from my shark cube, which was a good sign. Then I went for it. I popped in the cube, chewed it, and swallowed it. The verdict? Not particularly enjoyable, but not repulsive. Just kind of meh. If you’ve ever had one of those snack packs with cubes of cheese and turkey, the shark bits were exactly like the turkey cubes in terms of texture and chewiness. The only difference was the flavor. It had a slight taste of fermentation, but not enough to totally gross me out. I was almost disappointed that I didn’t find it as horrible as most visitors do. In fact I did something I would never have expected – I went back for a second cube. 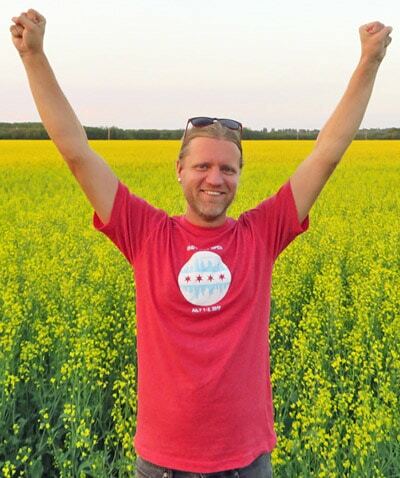 The second one was worse – the flavor of fermentation was a bit stronger. That leads me to believe that not all cubes taste exactly the same. Where do the sharks come from? Many environmentalists protest the presence of whale on Icelandic menus, arguing that it’s mostly tourists who eat whale and that killing the animals isn’t necessary. As far as I can tell, there are no such protests over the shark, since shark remains (somewhat) popular among locals. 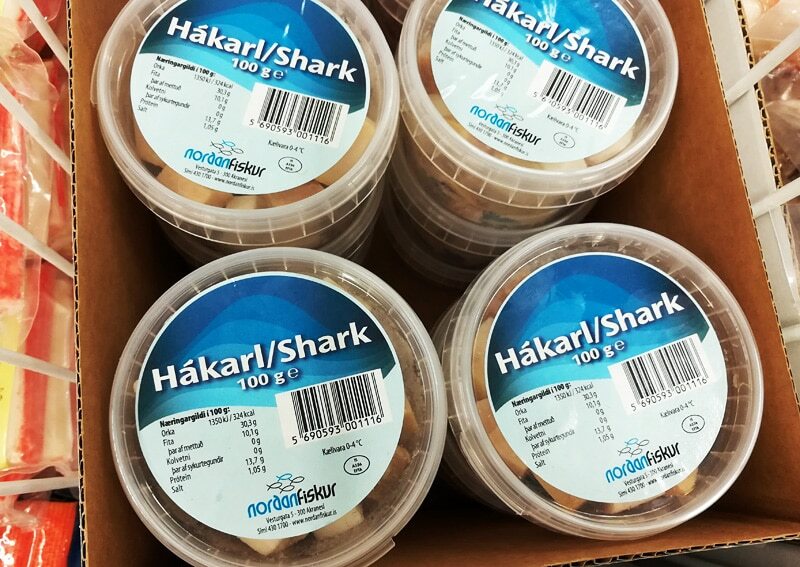 No, most Icelanders don’t sit down to eat shark dinners every night, but most grocery stores sell bags of frozen fermented shark, so somebody must be eating it. The sharks are mostly “Greenland shark” – that’s the actual name of the species. The shark corpses are placed in a hole underground for at least six weeks to ferment and drain the poisonous juices that would make you sick if eaten raw. Then, the shark is removed and hung to dry for four months or more. Eventually, it’s cut into cubes and sent to markets or restaurants. You can even visit a quirky museum (Bjarnarhöfn Shark Museum) to see the fermentation process in action. Shark costs a lot at Icelandic restaurants. If you’re interested in trying it, a side of four cubes of hakarl went for $5 at Cafe Loki, which was the cheapest price I could find. Oh, one other thing. Make sure to order the rye bread ice cream at Cafe Loki. It has the consistency and flavor of cookies & cream. Trust me! Would you try fermented shark? We have an animal, a shark, that to not die in frozen water uses urine in blood as a frozen protection (as your car). As many other animals of the artic seas does it. Which has a high Ammonia content. Ammonia is a basic element, not acidic. So, to eat it you need acidic elements to balance them and settle it down. We, in Spain, received from my youngest brother 400 grams of HAKARL, he spent for business reasons, the month of November 2018 in one of your nice east fijords. We tasted it as it is. The Anglo-Saxons and Americans over actuate, they exaggerate it a lot. It is a normal fish meat. Yes, you get the strong ammonia flavour, but that it is all. And the taste with a good vodka matches perfectly. You do not need to open the windows or eat it outside, because of the smell. Unless you are a weak person. 1. Rinse it in abundant cold water, 5-6 times, and let it dry, use kitchen paper to dry it. Then put it in the fridge in the upper level for a month. Take it with a good vodka as an aperitive, before lunch and dinner. It retains the same aftermath flavour as with the row one but not the nose strong ammonia effect.